These bins need a latch! 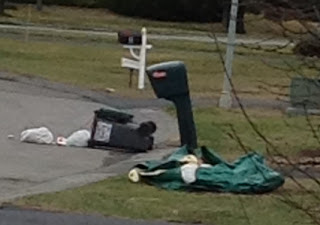 It was another windy day in Colonie a few weeks back and sure enough I was sitting behind my laptop while I glanced out the window to see a virtual garbage storm go by. This wasn’t the first time I’ve experienced this ugly sight and it didn’t take long for me to be sufficiently aggravated to rush out the door to snap a picture of the neighbor’s offending wheeled recycling bin which the wind had knocked over and looking up the road there was not just one isolated bin; there were several all spewing their week’s collection of assorted recyclables. I was readying myself to return inside when a gust upended my recyclable container and I spent the next 5 or so minutes frantically chasing my week’s collection of recyclable containers across my neighbor’s lawn. The great irony is that we consciously separate and clean our recyclables so that they will be reused and not pollute the planet so seeing the huge volume of these items on numerous windy days is very disturbing. As a first step I emailed a couple of local (Albany County) representatives. They were very gracious to listen to my concern and even more kind to gently let me know that truthfully a legislative remedy was not likely. Fast forward to a more recent weekend day. Since the above episode, I had noticed a lot of garbage accumulating in the wooded area of Constantine Farm between the Southeast corner of Crossing’s park and running toward the fields near Sand Creek middle school. I had written a note and placed it on the kitchen counter to bag up some of this garbage. (Yes, I have a sophisticated “to do” mechanism… jot it on a small slip of paper, stick it on the kitchen counter…that’s how I get things accomplished without forgetting). Thus, the time had come and I set a goal to fill 3 Hannaford garbage bags to make a dent in this eyesore. Trekking through briars and silently praying not to see any snakes I had no difficulty achieving my goal. 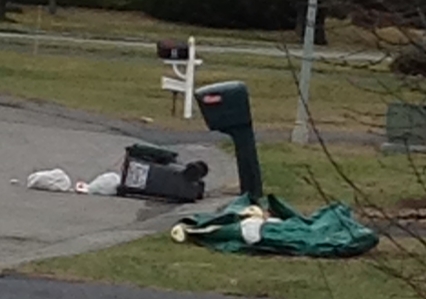 The overwhelming majority of my garbage appeared to be of two origins – “throw down” and “blown”. Throw down garbage are items discarded by thoughtless users of this stretch that connects the school and community to Crossing’s Park. I suspect some rationalize this behavior by telling themselves that the land is wooded which covers their deposit and that they are really a good person because they didn’t leave their discard in the park. These types are represented by the multiple dog poop bags that I picked up. I don’t know if there is much you can do with these types. The overwhelming majority of garbage from the “throw down” category were drink containers although it should be noted that some drink containers could possibly have been the result of a “blown” origin. In many cases, it was clear that they were of a throw down origin because they contained partial liquid still in the container. This included some paper drink containers but were mostly plastic. I also observed that of the plastic containers the overwhelming majority had no deposit markings (someone could not easily return the container for deposit which provides an incentive for these items to be picked up). In many instances these were water bottles that no longer had their labels. From my experience with returning my own bottles, I note that the labeling on water bottles is very flimsy and comes off much too easily. The packaging and labeling of water bottles could be improved. Second, I will note that there is a huge gap in the New York state bottle law. It makes no sense to me why plastic water bottles are subject to bottle deposit while items like Lemonade, Iced Tea, and sports and sugary drinks such as Gatorade or Snapple are not subject to bottle deposits. This seems like a gap that legislators could easily fix. Among my collected garbage that evidenced blown origins were newspapers, cardboard and those plastic shopping bags. The paper products, while substantial were not nearly as numerous as the plastic drinking containers and, even more promising, reflected evidence of decomposition (e.g. clearly biodegradable). Based on my experience in the neighborhood, some newspaper slots should be improved. Some have an open slot under the mail box and on windy days, the newspaper is easily blown out of this slot. My mailbox is of this type and after experiencing first hand having the newspaper blown away, I remedied the situation by affixing a piece of plastic type fencing to the back of the slot (and am happy to report no more papers blown away since). Due to environmental concerns, there has been talk of prohibiting large stores from using those plastic bags. I certainly found a fair share among my collected garbage. Prior to a flat out prohibition, I would like to see more stores offer an incentive for shoppers to use their own bag. Kudos to both Price Chopper and Target for their efforts in doing this! As reflected in the opening of this post our recycling efforts are contributing to blown origin garbage. Typically recycling has gone to single stream where all recyclable items are placed into a bin. Unfortunately both the loose recyclable items and the recycle bin are generally lightweight and as a result bins are easily capsized and these lightweight items strewn by the wind. It would seem that with all the smart people out there that some sort of latch could be designed so that the latch is easily and seamlessly disengaged as part of the movement in the “pickup” operation by the garbage truck.